A slight but enjoyable novel — often surprisingly amusing — that tells, through scores of usually very short chapters, about the relationship between hospital nurse Korede and her very beautiful younger sister Ayoola. The latter brings a whole new meaning to the term “drop-dead gorgeous” because of her bad habit of murdering the men her beauty inescapably attracts. It’s Korede’s task to clean up the messes Ayoola leaves behind and dispose of the bodies. Matters come to something of a head when Ayoola takes on as her new boyfriend Tade, a hospital doctor whom Korede has for years adored from afar . . . The novel concerns itself also with other relationships. One is that between the two sisters and their (thankfully now deceased) father, who was evidently a brute and a tyrant to his family. 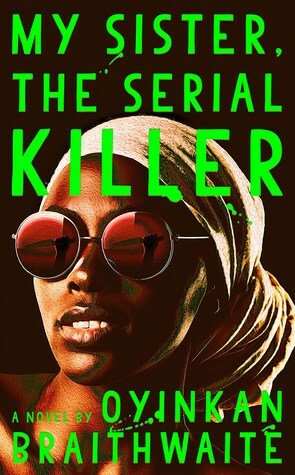 Most interesting of all, for me at least, is the relationship between Korede and one of her patients, Muhtar, a man who’s been in a coma for months and isn’t expected ever to come out of it. He does come out of it, though, and to general astonishment proves to remember many of the things Korede has told him while sitting at his bedside to keep him company. Trouble is, she thought Muhtar was the one person she could safely tell about the Ayoola problem. Uh-oh. My Sister, the Serial Killer doesn’t really look in deep and it doesn’t really look out far, but it’s certainly entertaining. As good a way as many to fill an evening. Glad you enjoyed this too, even if it is a little slight. I hadn’t really reflected on the language but you are absolutely right – that was a significant part of the appeal for me too! I noticed you’d given it the thumbs-up on Goodreads. I enjoyed the novel’s satire but was somehow left wanting a bit more of . . . something. Hmm the title put me off when I’ve crossed paths with it previously. A maybe if I didn’t have so much already. I learned from the small print on the book’s copyright page that it was published in an earlier version in Nigeria as Thicker than Water. While that’s not a great title it’s in fact a far better representation of the book. I am glad you reviewed this because I was definitely on the fence about reading it. Now I will give it a try …. eventually. I’ll be interested to hear what you think of it once you get to it, Tracy.